A What Are You Reading? forum on recent publications in the field. Spectacular Modernity: Dictatorship, Space, and Visuality in Venezuela, 1948-1958. Lisa Blackmore. Pittsburgh: University of Pittsburgh Press, 2017. Pp. 280. $28.95 (paper). This book explores the relationships between modernism, modernization, and dictatorship, and in the process repoliticizes the discussion of a crucial period in Venezuelan modernity. Blackmore approaches these relationships through Raymond Williams’s notion of a dominant cultural formation, that “sense of reality shaped by the complex interlocking of political, social, and cultural forces that permeates a whole body of practices, expectations, and aspects of life” (19). Relying on detailed historical research and archival work, Blackmore conducts a complex and nuanced examination that does not avoid the subject’s many sensitive nerves. From 1948 to 1958, the relationships between modernism, modernization, and dictatorship were too close. It is rather unpleasant to admit, for example, that the design and construction of Ciudad Universitaria de Caracas, home to the Universidad Central de Venezuela, was an important component of dictator Marcos Pérez Jiménez’s massive propaganda campaign. The dictatorship sought to demonstrate that such progress could only be achieved under a military government. As such, and especially between 1952 and 1957, “Pérez Jiménez implemented a developmentalist doctrine of modernization through public works” (36). The dictatorship elaborated its propaganda atop these numerous and enormous public works. This propaganda was designed and produced by the Hamilton Wright Organization, the agency that managed the dictatorship’s public relations from 1952 to 1958. The agency made 165 documentaries and newsreels, many of them coproduced by companies like Warner Brothers and Universal International and supported by local companies like Tiuna Films and Bolívar Films. Blackmore analyzes a number of these documentaries, especially those directed by Manuel Vicente Tinoco. In one small imprecision, Blackmore states that Mario Briceño Iragorry would have become president in the 1952 election to choose a constituent assembly (but did not when Marcos Pérez Jiménez disavowed the results) (126). In reality, the thwarted candidate was Jóvito Villalba. This single error, however, does not diminish the overall quality of a book that makes an enormous contribution to Venezuelan, Latin American, and modernity studies. 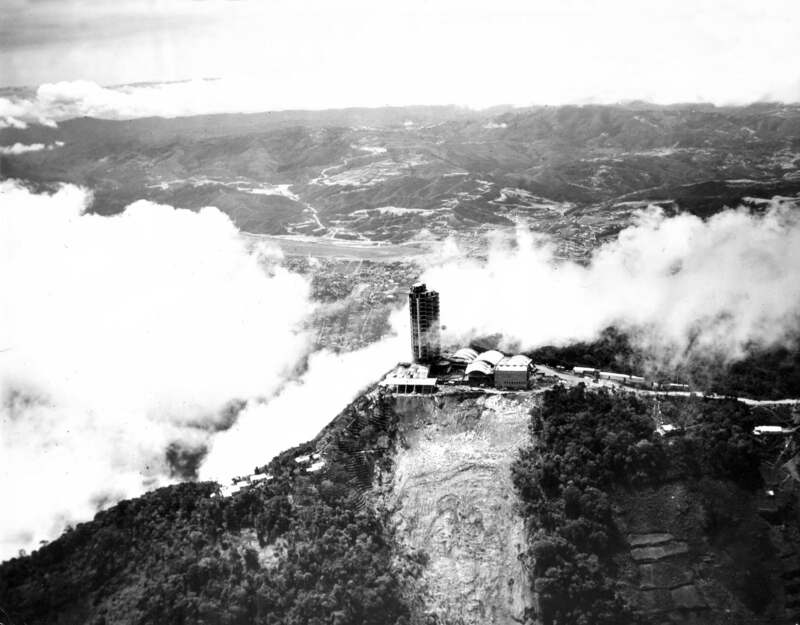 An aerial view of Tomás José Sanabria´s Hotel Humboldt in Caracas. Archivo Histórico de Miraflores. Returning to those uncomfortable relationships, it is also awkward to recall that in 1954, during the Cold War, the dictatorship hosted the Tenth Inter-American Conference at University City in Caracas. 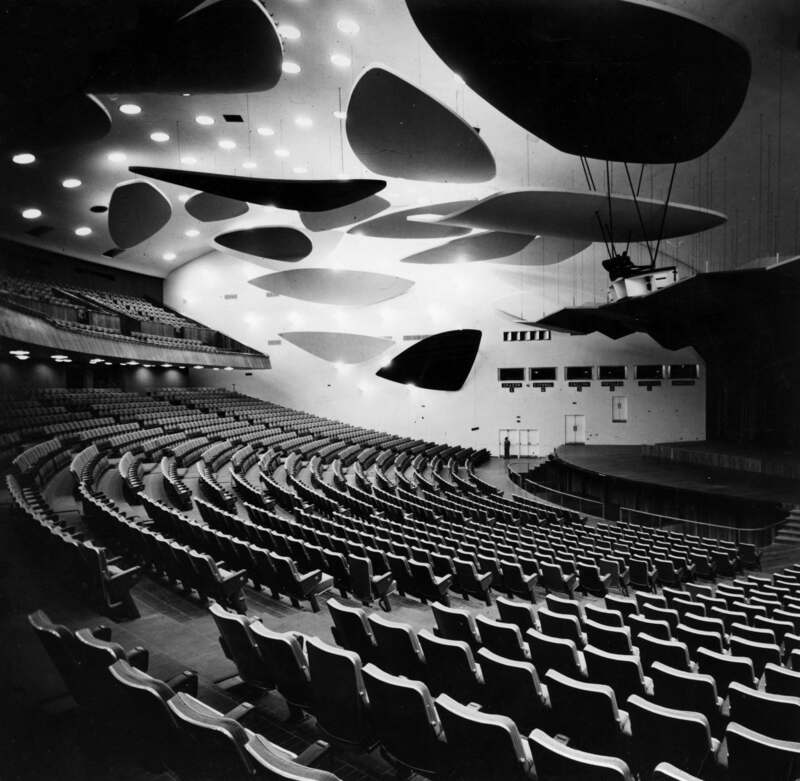 The dictatorship made the conference delegates its audience for the unveiling of University City’s impressive Grand Hall, with a ceiling that featured Alexander Calder’s Clouds or Flying Saucers, the American artist’s largest and arguably his most endearing work. Another example is the fanciful five-star Hotel Humboldt, a pet project of Pérez Jiménez that was constructed on top of Ávila Mountain. A sort of lighthouse of Venezuelan modernity, the hotel has views of the Caribbean to the north and Caracas to the south. 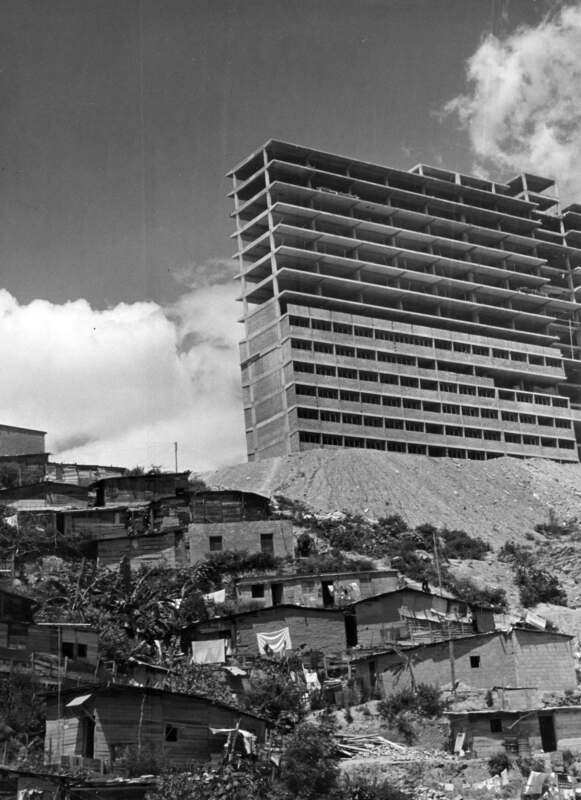 These structures, like many others that the dictatorship constructed in its state-led modernization campaign, transformed space in an attempt to show that Venezuela had achieved modernity. At first view, and as Time and Life magazines reported, “Venezuela looked like a success story of capitalist development” (8). To the dictatorship, “modernist architecture was undeniable proof of progress that justified the rupture from democratic rule” (14). Under the influence of transnational and US-based oil companies, the country was converted into an impressive laboratory of modernism, its monumental buildings serving as “harbingers of progress” (9). Meanwhile, the dictatorship was destroying the fabric of local democracy. Aula magna with Alexander Calder´s Nubes (Clouds) hanging from the ceiling. Ciudad Universitaria, undated. Archivo de Fotografía Urbana. The most important twentieth-century architects in Venezuela were Carlos Raúl Villanueva and Tomás José Sanabria. Villanueva mapped out Ciudad Universitaria de Caracas, an impressive tropical Ville radieuse, and Sanabria came up with the Hotel Humboldt, a transparent lighthouse-overlook onto Venezuelan modernity. These structures are an essential part of the canon of local modernism. 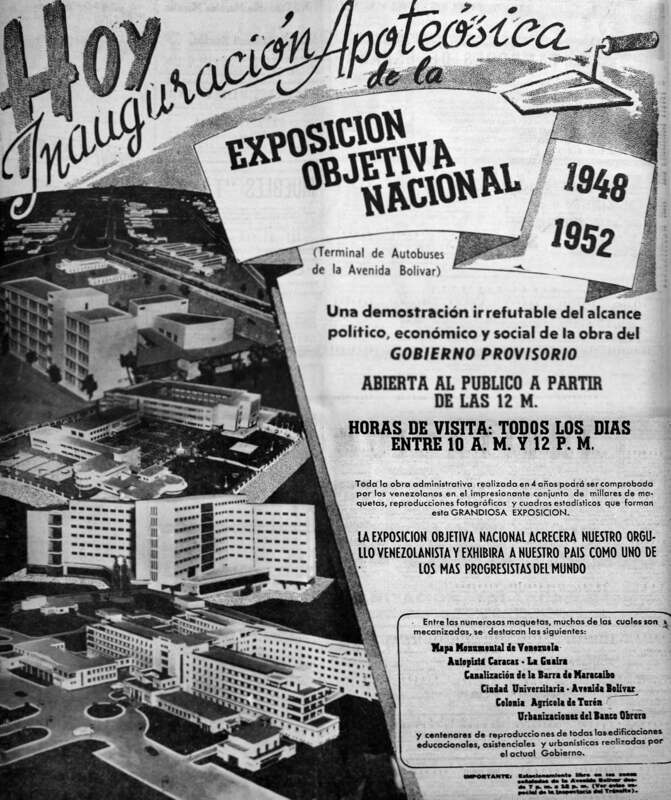 But how can we reconcile these accomplishments with the fact that the architects worked for Pérez Jiménez in full knowledge that their work, and even these particular works, would be used as propaganda for the dictatorship’s “nation branding campaign” (75)? A superblock under construction towers over ranchos below in the mid-1950s. Archivo Histórico de Miraflores. This question is uncomfortable, but that, of course, does not excuse us from asking it. And herein lies Blackmore’s achievement: she not only approaches the issue, but also provides a thorough and insightful response. She conducts her political analysis of Venezuelan modernism alongside a study of the enormous variety of visual devices that the dictatorship and private sector deployed to train the gaze of Venezuelans (and set in motion a super-rapid process of Modernization 101). According to the dictatorship’s elaborate narrative, this process would “update” the country, achieving the “miracle” of “fast-track modernity,” along the lines of Juscelino Kubitschek’s developmental management of Brazil, but in a dictatorial mode. With the return to democracy in 1958, however, it became clear that the façade of this supposed miracle concealed the fact that the country had not experienced the benefits of modernity. Invitation for the general public to visit the Exposición Objetiva Nacional. El Nacional, November 23, 1952. Blackmore studies these and other massive urban interventions, including superblock housing projects, high schools, hospitals, prisons, highways, pathways, and especially El Helicoide shopping center. Her meticulous analysis of visual devices—like documentaries, photos, books, magazine covers and articles, publicity campaigns, exhibitions, maps, patriotic parades, Carnival troupes, beauty queens, and store windows—reveals how the conception of space and visuality was reshaped “in the mold of modernity” through the so-called New National Ideal (4). The political program sought to bring about “the transformation of the physical environment and the moral, intellectual, and material improvement of the country’s inhabitants” (34). Like space, bodies were objects to transform through practices of discipline, enjoyment, and demobilization (in educational institutions, recreational institutions, housing, prisons, and through torture). Blackmore also looks at the politics of immigration that brought some 382,950 Europeans to Venezuela in 1956 with the idea of “improving the bloodline” (58). The dictatorship believed that progress would be achieved through “racial mixing” (59). 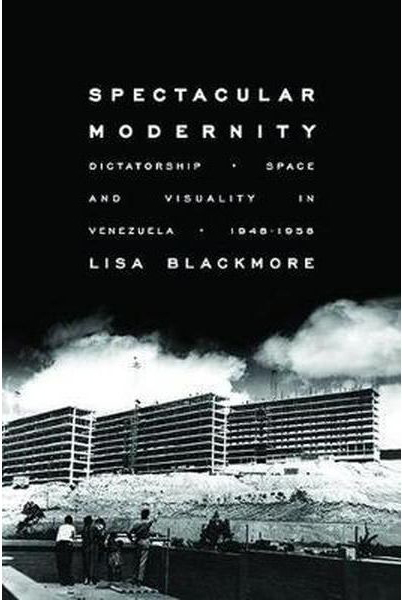 Blackmore uses her analysis of these “political, social, and cultural forces” to construct “spectacular modernity,” a new concept of modernity that presupposes “the entanglement of the politics of the dictatorship with aesthetic innovations in spatial arrangements and visual culture” (19). She argues that spectacular modernity is an “effect” on its spectators (one that converts Venezuelans into an audience of modernity), but also, and more importantly, that this modernity is instantaneous. According to the dictatorship, Venezuelans became modern overnight: “By taking up residence in the superblock the family has literally crossed the threshold to modernity” (57). In elaborating this concept, Blackmore relies on a 1994 interview of José Ignacio Cabrujas by Milagros Socorro. Cabrujas states his belief “like it’s the truth” that in the 1950s, no one could have modernized the country better than Pérez Jiménez (18). She also relies on Fernando Coronil’s seminal book Estado Mágico (1997) and its argument that “the discovery of oil set the mold of the rent-oriented economy of the modern Venezuelan State and induced fantasies of instant modernity” (19). Oil, according to Coronil, also “enables state leaders to fashion political life into a dazzling spectacle of progress” (19). 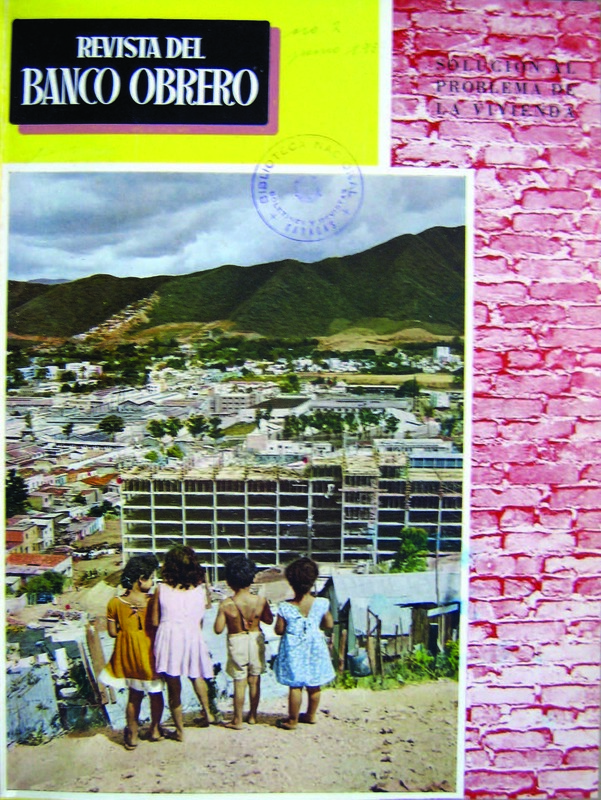 Revista del Banco Obrero 1.2 (June 1954). Blackmore’s principal contribution, however, is her argument that the staged modernity that sought to co-opt Venezuela’s citizenry wound up producing rebellion. Spectacular modernity exceeded the dictatorship’s propagandistic intentions, fixing itself, for better or for worse, in the Venezuelan imaginary to the present day. As such, spectacular modernity “has provided a means of gathering modernization projects, spatial arrangements, visionary gazes, and performances of progress onto a critical common ground” (208). The relevance of the concept is therefore not limited to the period that Blackmore examines. It is also pertinent to other periods of Venezuelan history, like the 1970s and the first decade of the twenty-first century, moments when the relationship between modernity, visuality, and construction—boosted by extraordinary oil revenues and the desire for transformation—combined to allow persistent state-led modernization to reproduce mirages of instantaneous development. Moreover, Spectacular Modernity applies to similar processes in countries like Mexico and Brazil that share Venezuela’s heroic attempt to modernize against a backdrop that loudly contradicts that project. It is also useful in understanding more generally the other face of modernity, which presupposes liberty at the same time that it produces spaces of enclosure and demobilization.